Last updated 10/6/2015: Microsoft's next iteration of Office will be known as Office 2016 and its development is well underway. Both Mac and Windows users are able to download the preview version for a quick spin with Microsoft committing to updating it fairly regularly. While no dates have been set for a launch, expect it to be launched within days of Windows 10 (whose launch date has been set for 29/7). Note that there will be three different versions of office: the traditional, client one, one optimised for touch and one for mobile devices. Also, you won't be able to use Office 2016 and Office 2013 concurrently. You can check our Office 2016 preview here as well as a handy 50-tips guide. Since this article was last updated (October 2014), Microsoft has issued more than one hundred updates for the various components of Office 2013. Learn more about those updates - including some security-related ones - here. June however saw a whopper one with more than 50 updates (yes 50) in one release cycle, albeit for all the various Office SKUs. The original review is below. Office 2013 is the latest refresh of Microsoft's near ubiquitous business suite. The latest version sees it get the Windows 8 treatment, with a touch-friendly interface and a sparser look, as well as new features in every application. As part of the launch, Office has also reached a new landmark by going into the cloud with subscription pricing, on-demand installation and automatic syncing of settings and documents you save online rather than offline. It's called Office 365. That particular method of purchase ensures you're always up-to-date, even if the software changes - check out our Office 365 review. While the main thing you'll notice with Office 2013 the new look, there are some really interesting features under the hood - though sadly not for Windows XP users, who are now excluded. Office 2013 is strictly for Windows 7 and Windows 8 users. As usual, there are multiple versions of Office 2013, but this time around the different editions are not just about whether you're using them at home or in a business or which applications are included. 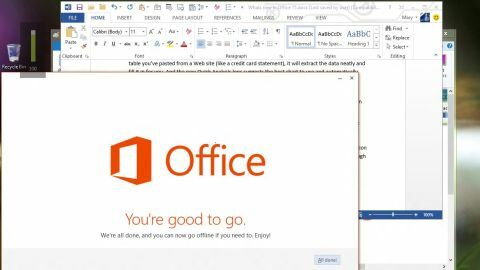 If you prefer to pay an annual subscription to get extra features, Office 365 editions let you download the Office 2013 applications onto multiple PCs (or share them with your family). For home users, there are four options. Buy the boxed software and you can put it on one PC. Office Home and Student 2013 with Word, Excel, PowerPoint and OneNote costs £109.99/$139.99; Office Home and Business 2013 adds Outlook and costs £219.99/$219.99. Office Professional 2013 has the full set of programs for £389.99/$399.99; Word, Excel, PowerPoint, OneNote, Outlook, Access and Publisher. Also, as you might expect, Office 2013 and Office on Demand only run on Windows 7 and 8, not on XP or Vista. Although Office 365 Home Premium might also sound like a great deal for a small business, it's not licensed for commercial use (Like the Windows RT versions of Office 2013) unless you already have an Office business licence. Instead, you need one of the Office 365 business subscriptions. These include the new Office 2013 versions of Exchange, SharePoint and Lync Online, which are already available to run on your own servers. It's taking some time for Microsoft to upgrade Office 365 to run these new server versions, which explains the later availability (there are a number of issues in SharePoint the Office 365 team is working on). We've tried these out with the Office 2013 applications (and we looked at SharePoint Online 2013 in more detail here). If you're looking for five or more copies of Office 2013 and you don't want the Office 365 services at all, you can buy Office Standard 2013 (with Word, Excel, PowerPoint, OneNote, Outlook with Business Contact Manager, Publisher, the Office Web Apps and limited Lync, SharePoint and rights management services) or Office Professional Plus 2013 (with the full range of desktop Office programs and server features) through volume licensing. We've already looked at the final (RTM) version of the Office 2013 applications. Now we've been able to try out the Office 365 Home Premium service with the new Office.com site, where you can download some of the new Office apps (although the apps for Outlook won't work until you have Exchange 2013). With any of the Office 365 subscription version of Office 2013, you don't have to worry about downloading and saving a large installer for Office (or even about uninstalling previous versions of Office, apart from Outlook). Whether you start the download from the Office 365 site or you try to open an Office document on a PC that doesn't have Office, the programs stream from the cloud. This is a much improved version of the click-to-run virtualisation that Microsoft has used for the Office trial versions for a few years, which enables you to start using the applications just a few minutes after you download them. You don't have to wait for the full download; you can use the first features as soon as they download and if you click on a tool that hasn't yet downloaded, the installer will get that next. The streaming happens quickly enough that the slideshow of new features you can watch while the other applications install is actually running in PowerPoint (and you don't have to watch it unless you want to). You do have to pick a few options like the language to use for Office, the design you want to see in the ribbon and whether you want to send Microsoft anonymous telemetry about how you use Office. You can also fill in your Microsoft account details, which Office uses to sync settings like recent documents from SkyDrive, email accounts, custom AutoCorrect entries, the list of your Office Apps and the buttons you add to the Quick Access Toolbars. It might seem odd to sign in with your Microsoft account on the Office.com site and then get asked for it during installation, but this is how you share the subscription; use the account that's paying for the licence to log in to Office.com, start the download, then sign in with the account of the person who will be using Office on each PC. Office 365 Home Premium adds several more designs that you can use to decorate the Office ribbon, including doodled circles, lunchbox sandwiches, pens and pencils, cartoon fish and spring leaves. It's a little odd, but there's something for most tastes (including a blank ribbon). Once the programs are installed you can also choose from three Office themes (click your account picture at the top of the screen and choose Account Settings or open File > Account. The default white gives you the clean look you might have seen in the Customer Preview or in Office RT; pale Grey adds a light tint to the ribbon and other panes and dark grey is a high contrast colour scheme that puts a mid grey on the ribbon and panes and replaces most of the accent colours in each application with a very dark grey. If you're not a fan of the new Windows 8 look, experiment with the themes to see if an alternative changes your mind.